The Right to Farm Bill and The HATE COMES Out! Well, the farmers just got some news that was good today. Finally. Interesting enough, there were some 36 legislators introducing the Hawaii Right to Farm Act. This spells out bad news for the counties, who have gone rogue in creating their own laws. Interesting enough was that the Chair of the Agriculture committee isn’t even on board with this law. Does that mean Representative Wooley doesn’t support farmers? Yup, that’s what it means. She prefers to support her activists that do this kind of stuff. If you wear red shirts and yell loudly, this is the pono way of doing things, “especially if you are not of the “Rubbah Slippah” folks. How to get your laws passed in Hawaii. Yell! Now that the A’oles know that there is a bill on the table, take a look at the comments coming out once again. Here’s some of the commentary that was posted on the Big Island News Video post today. 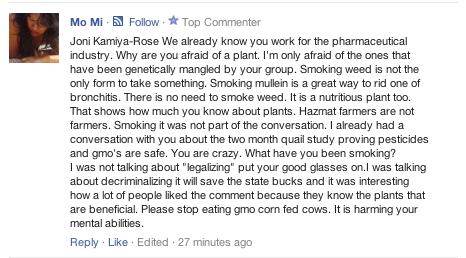 And it never fails that there is at least one agroterrorism comment. We shouldn’t be surprised to see where these A’oles come from to know why these comments are so ugly. They ain’t no local folk that’s for sure! And our “crop stomper” is a believer in conspiracy theories… Chemtrails. When you’re not from Hawaii, it’s pretty apparent that activism has to be full of hate, cursing, and threats. More reason why legislators should not listen to these people’s demands. This entry was posted in Don't Post that A'ole, Local Values, Local Ways, No Aloha Commentary, No Aloha to Farmers and tagged GMO Free Big Island, Hawaii Right to Farm Act, Julie Allen Paul, Kathy Barnett, Linda Menzies, Mo Mi, Sherrie Moore on January 24, 2014 by hawaiifarmersdaughter.